Home / News / Not State Rowdy, it is Vinaya Vidheya Rama! Not State Rowdy, it is Vinaya Vidheya Rama! Ram Charan and Kiara Advani's film in Boyapati Srinu's direction is taking shape at a brisk progress. 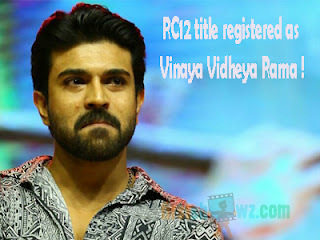 There have been rumors that State Rowdy is the title of the film, but the latest news is that Vinaya Vidheya Rama is the title and Not State Rowdy. It's surprising that Boyapati Srinu went for a softer title for Ram Charan for a commercial mass entertainer. The Mega Power Star's characterization in the movie is going to be the highlight of the movie, and so is the negative lead Vivek Oberoi's role. Kiara Advani is the heroine and Aryan Rajesh, Prashanth, Prasanna, and Sneha will be seen in key roles. DVV Danayya, the producer of the film has registered title Vinaya Vidheya Rama with the Film Chamber and he is yet to announce it. The film is expected to hit the screens for next Sankranthi.